(Nanowerk News) In the future, a wireless charging system will allow electric cars not only to charge their batteries, but also to feed energy back into the power grid, helping to stabilize it. The cost-effective charging system achieves high levels of efficiency across the whole power range, from 400 watts to 3.6 kilowatts, while the car and the charging coil can be up to 20 centimeters apart. Fraunhofer researchers are presenting their prototype from September 15 to 18, 2015 at the IAA International Motor Show in Frankfurt (Hall 4, Booth D33). When it’s pouring rain, a driver who has to connect a thick, unwieldy cable between their electric car and a charge spot is sure to get soaked to the skin. But sometimes there’s no alternative – the battery is empty. Using wireless inductive systems to charge the car is much more convenient. This involves transmitting energy through the air, or, more precisely, through a time-varying magnetic field. The technology is essentially based around two coils, with one built into a road, a parking space or a garage, and the other fitted to the underbody of the car. In conjunction with suitable capacitors, these coils form a sort of resonant "antenna system for energy transfer." The nearer the two coils are to each other, the more efficiently the energy is transferred. Researchers at the Fraunhofer Institute for Wind Energy and Energy System Technology IWES in Kassel have come up with a more cost-effective design for such inductive charging systems. "We deliberately use standard components that are already available on the mass market," explains Marco Jung, deputy head of the converter technology department at Fraunhofer IWES. In addition, the researchers use coil systems that require fewer ferrite sheets. The sheets are needed to control and shield the magnetic field and are very heavy on account of the iron oxide they contain. They are also ex- pensive. Reducing the amount of ferrite material used further decreases the weight and cost of the coils. Another advantage is the specially designed power electronics and coil systems, which means that the system works very efficiently even when the coil in the car is some 20 centimeters away from the coil in the road. "Even with an air gap of 20 centimeters, we achieve an efficiency of between 93 and 95 percent – and do so across the entire power range, from 400 watts to 3.6 kilowatts," explains Dr. René Marklein, project manager at Fraunhofer IWES. "Comparable systems achieve that kind of efficiency only over shorter distances, which limits their usefulness for cars with larger ground clearance." Whereas the coils are built into the road and the underbody of the car, the charging system is carried in the vehicle and contains the electronics and connections for various charging cables. The scientists have designed the system so as to give drivers maximum flexibility: it not only permits inductive charging, but also has a one-phase and a three-phase power connection thanks to a multi-functional system concept. This allows drivers to also charge their vehicle at ordinary power outlets and charge spots. As well as charging up the batteries, the system can also discharge them. Among other advantages, this can help to stabilize the general power grid. How does that work? When the sun is shining all day or strong winds are sweeping the country, solar cells and wind turbines often supply more energy than is needed at the time. If too much electricity was fed into the grid, however, the voltage could rise and might even destroy electrical devices. In favorable weather conditions, grid operators therefore throttle the output that solar and wind plants feed into power grids. But if car batteries were used as a sort of buffer, the surplus electricity could be stored there temporarily and then fed back into the grid when the sun clouds over or the winds die down, further increasing the proportion of renewables in the energy mix. The scientists are presenting their wireless inductive transmission system at the IAA International Motor Show. In addition, Fraunhofer researchers are exhibiting further electromobility solutions, including a powertrain with an air-cooled wheel hub motor, a lightweight construction energy pack, and high-performance storage modules. Usually, induction plates or coils are integrated into parking bays. Because they carry high currents, they heat up and can pose a danger to any objects and animals that might be underneath the car. For example they could injure cats, who often like to sit under cars. 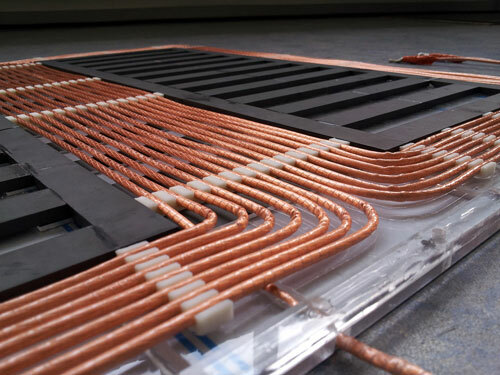 For this reason, researchers at the Fraunhofer Institute for Integrated Systems and Device Technology IISB in Erlangen have developed an alternative to the induction plate in the ground that involves supplying the car with energy at its front end near the license plate. The technology is based around a charge spot that cars can park right next to, leaving only a small gap. This allows a very cost-effective and lightweight charging system to be implemented – one that weighs only 3 kilograms at a charging capacity of 3.7 kilowatts. If a car brushes against the charge spot too strongly, it folds away, preventing the vehicle from getting damaged. Electric cars have only a limited range. In the future, however, it will be possible to charge cars while they are moving: researchers at the Fraunhofer Institutes for Manufacturing Technology and Advanced Materials IFAM and for Transportation and Infrastructure Systems IVI have constructed a 25-meter-long test route along which coils have been set into the road. The project was supported by the German Federal Ministry of Transport and Digital Infrastructure and two further project partners. It was a success: the FreccO demonstrator, a sports car converted into an electric vehicle, managed to travel the strip at a moderate speed while simultaneously charging its battery.